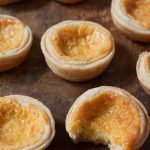 This simplified version of the classic pastéis de nata - Portuguese custard tart uses bought puff pastry and a simple custard to make these delicious little tarts. Preheat the oven to 190℃ (170℃ fan)/375°F/gas mark 5. Lightly grease a 12 hole bun or muffin tin. Unroll the pastry and remove the lining sheet, then reroll to form a log of pastry. Cut into 1.5cm (½in) thick slices. Lay each piece on a lightly floured surface and roll out each round until they are 9cm (3½in) in diameter. Press each round into the prepared tin. Place the custard powder and sugar in a bowl with the vanilla paste and egg yolks. Add a little milk and whisk to form a smooth paste. Heat the milk with the cream in a saucepan until almost boiling. Gradually whisk the hot milk into the egg yolk mixture, then return to the pan. Heat gently stirring constantly until the custard thickens slightly.